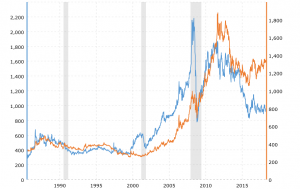 As the chart below shows, the price of platinum has been significantly less than gold for nearly four years now – in fact, the platinum to gold ratio now stands at about 0.70, meaning platinum is worth about 70% of gold. Given this sustained price change, we made the decision to stop offering white gold as an option for our engagement rings and start offering platinum as the standard white metal. We also offer engagement rings in 18kt yellow and rose gold, both paired with platinum settings. As far as I am aware, Jogia Diamonds is the only jeweller (at least online) to offer platinum at the same price as 18kt gold. However, whilst platinum may be only 70% of the cost of gold, the true cost of platinum and 18kt white gold needs to be taken into account. Firstly, 18kt white gold is only 75% gold, but is mixed with around 14% palladium, which is another expensive metal. Platinum is 95% pure, with the other 5% a non-precious metal – in our case – Ruthenium. Still, despite 18kt white gold containing less pure metal, it is still more expensive per ounce than platinum alloys for jewellery making. Going by these charts from ABC Bullion an ounce of of 18kt white gold contains A$1475 of gold and palladium and an ounce of platinum alloy contains A$1107 of platinum. That means that platinum alloy is about 25% less valuable as a commodity than 18kt white gold. That said, platinum alloys are generally about 20% denser than 18kt white gold alloys. Thus, 20% more platinum is required. Therefore, in raw metal cost, platinum still comes out around 5% cheaper than 18kt white gold to produce the same article of jewellery. Refining of scrap and waste platinum a lot higher. Refining waste and scrap platinum to produce usable platinum alloy is about 10 times the cost of 18kt white gold. It is also a lot less environmentally friendly. Platinum requires a little bit more labour than 18kt white gold. Platinum casting requires specialised and expensive equipment, tools and consumables. All of these costs add to the cost of producing a platinum ring, which in turn makes platinum jewellery more expensive to produce than in 18kt white gold – but not by much. As alluded to previously, platinum is far less prone to bending, thus holds diamonds in more securely. Therefore is a much more suitable metal for engagement and wedding rings which are diamond set and are worn on a day to day basis. However, for other jewellery such as mens wedding rings, I would still recommend 9kt or 18kt white gold as these alloys are harder than platinum alloys and there usually aren’t any diamonds set into the band. This entry was written by Nikhil Jogia and was posted on on Wednesday, October 10th, 2018 at 4:31 pm	and is filed under Taking Care of Business. You can follow any responses to this entry through the RSS 2.0 feed. You can leave a response, or trackback from your own site.